Sitting behind a desk every day can be a killer for your back. However by using an ergonomic office chair you can make the world of difference to your health and working experience. You may have heard the term 'sitting is the new smoking'. This has come about due to the rise in health problems from people who live sedentary lifestyles or have to sit down every day for work. So, if you work in an office and have to spend a few hours each day sat behind a desk, then you are at risk. As those few hours sat at your computer or doing paperwork can take a massive toll on your back if you're not careful. Maintaining a healthy posture as you sit. Setting up your work area so that you are not straining your neck, back, or eyes. Taking regular microbreaks where you get up, stretch, and move around. Investing in an ergonomic office chair that supports your back and keeps you correctly aligned as you sit. And in this article I'm going to focus solely on the last part. As sitting in a cheap and generic, one-size fits all type of office chair is a recipe for disaster for your back. Choosing an ergonomic office chair on the other hand will encourage you to sit with the correct posture and ease the pressure. Which is absolutely vital for maintaining your back health and keeping your pain levels down if you have to sit for a few hours per day. And luckily there are some fantastic models on the market to choose from, with what I consider to be the best ones below. These range from high-end options right through to good value choices, so make your selection depending on your needs and budget. 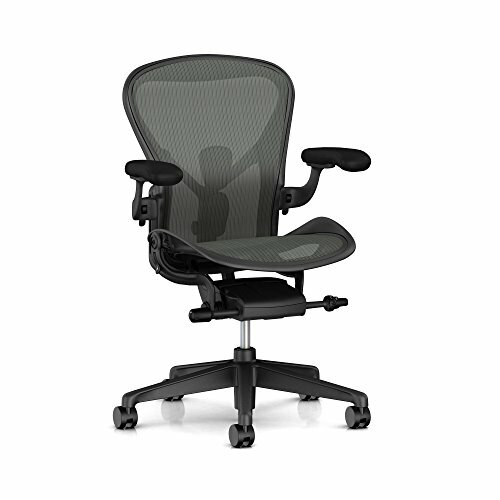 Most stylish - Herman Miller Aeron Chair. 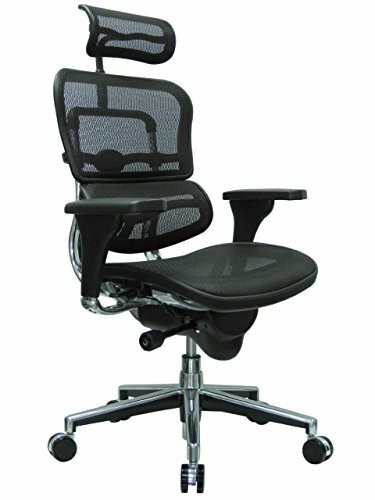 Best high-back with headrest - E﻿rgohuman High-Back Swivel Chair. Best value option - S﻿pace Seating Professional AirGrid Chair. But first let me explain why getting a good chair is so important. Why Do So Many Office Workers Suffer From Back Pain? As you may have worked out by now, sitting down all day isn't great for your back. A weakening of your spinal discs caused by compressed vertabrae. Weakened core muscles from a lack of activity. So firstly, when you are sitting down your vertebrae become compressed, which can lead to a weakening of the spinal discs that support them. This occurs as your spinal discs stay healthy by expanding and contracting when you move. As this allows them to take in the blood, oxygen and nutrients they need to keep them strong and able to support the full movement of your spine. However when the vertebrae of your spine are compressed these discs get squeezed, which starves them of oxygen and nutrients and they eventually begin to deteriorate. The result of this is your spine becomes less supported and flexible, with your lower back in particular having to carry more of the burden in your day to day life. Which only leads to more back pain. And secondly. sitting down for long periods leads to a weakening of the muscles that support the spine. As to maintain healthy muscles and joints you need to keep them moving and working. However, if you sit for hours at a time then your back supporting muscles such as your hamstrings, glutes and abdominal muscles will all be left dormant. Which leads to your back getting less support as a result and also an increase in muscle soreness and stiffness, especially in the hip area. And the combination of this stiffness and lack of support can also create muscle imbalances in the body which can pull your spine out of alignment. Increasing the pressure and strain on your back as well as causing posture problems. And sitting with a bad posture puts even more pressure on your lower back and leads to even more pain! So, sitting sounds pretty dangerous for someone that has to do it for the majority of their working day right? Which is why getting yourself a high quality ergonomic office chair that can counteract these problems is a sound investment. Because using a crappy one will only make your back problems even worse. Why Do Crappy Office Chairs Cause Back Pain? If your office chair looks like this then get rid of it! The problem with cheap, mass-produced office chairs is that they are designed as a one-size fits all solution. But what you often end up with is a one-size fits no-one chair! As you can't adjust the chair to fit the individual you may be forced to sit in an awkward posture which puts pressure on your spine. This can have the added misery of causing you to develop a poor posture that lasts long after the workday is over. They don't provide you with any lumbar support, so you sit with your spine in an unhealthy 'C' curve rather than a healthier 'S' shape. As you can't adjust the height of the arms on these chairs, your shoulders and upper spine experience more strain. The foam padding that most cheap chairs come with in the seat flattens out quickly, leaving you with no support and a sore bum! And being cheaply made they tend to break easily, which makes them even worse to sit in all day. So if you're currently sitting on one of these chairs while reading this, then do yourself a favour and invest in an ergonomic chair instead. And I'll show you the best office chairs to go for soon, but first let's look at the benefits of upgrading your current chair. Ergonomic office chairs are great, as they can be adjusted in a number of ways so they fit whoever is sitting in them perfectly. Which is great for helping you to get comfortable and ease your back pain. Improved lumbar support for your lower back. Adjustable back support to suit the spinal curvature of any spine, so you are encouraged to sit with a natural 'S' shaped curve in your spine, rather than a 'C' shaped curve. Tilt control so you can move naturally in the chair, which keeps your core muscles active as you sit. Increased seat depth, which allows your lower back to rest against the back of the chair and takes pressure off your thighs. Being able to adjust the hip position of the seat improves your posture and helps you avoid developing a forward-tilting pelvis. Adjustable arms allows you to get them at the right height to support you and take the strain off your shoulders, neck, and upper spine. Being able to adjust the seat height so you can place both feet flat on the floor relieves pressure on your lower back. The mesh material used on the backs and seats of ergonomic chairs allows your body to breath as you sit, keeping you cool rather than hot and sweaty like padded chairs. The 5-point castor bases provide greater stability, balance, and even distribution of weight. Overall using an ergonomic chair every day encourages you to maintain a healthy posture, and these habits can improve your posture as a whole too. They are also more comfortable to sit in, allowing you to work for longer periods of time without any nagging pain. And a wise investment for your health, comfort, and productivity at work. However not all these chairs are built the same, with some coming with all the bells and whistles, while others remain more basic. And which one will suit you the best will ultimately come down to your personal preferences and budget. So with that in mind I've chosen a selection of ergonomic chairs that are all great for your back. However they do differ in price, look, features, and size, so have a read through and see which one you like the sound of the most. The more expensive ones will have greater features and more adjustable options, but if you are on a tight budget then the cheaper ones can also do a good job. The Herman Miller Aeron chair is a much loved classic due to it's awesome look and iconic design. However it doesn't just look good, it's also a fantastic ergonomic chair that can be adjusted to the most minute detail. And this puts it firmly among the best office chairs for the health of your back. As it has great built in lumbar support, making it an excellent choice for your back. This comes in the form of two PostureFit SL pads in the back of the chair. One of these pads provides stability for your sacrum (base of your spine), while the other provides support for your lumbar region (lower back). And you can adjust the position of them both to either be closer to your body or further away, meaning you can get support exactly where you need it. The seat of the chair also comes with some great adjustable options for your back. Firstly, the pneumatic lift allows you to get the seat height perfect for sitting at your desk while keeping both foot on the floor. Which takes the pressure and strain off your body, while also increasing circulation and blood flow to your muscles. And you can also change the seat angle from neutral (parallel to the floor) to engaged (tilting you forward by 5 degrees), which can be handy for maintaining a healthy posture when typing on the computer. Then there is the tilt mechanism, which is probably the best feature of the Herman Miller Aeron chair for your back, as it keeps your core muscles active while you sit. This controls the amount of resistance you feel when leaning back in the chair, meaning you can adjust the tension of the tilt to make it harder or easier on your body depending on your preference. And there are 4 locked tilt positions that you can set depending on which task you are doing. So there is an upright position that will keep you at a 90 degree angle helping you to stay in a healthy posture. And an engaged position that is great when you are carrying out tasks that require you to lean forward. You also have two positions for tilting backwards too, mid-recline or full-recline, which are great for leaning back and relieving the pressure. So if you suffer from lower back pain in the office, this chair will really help you to fix it. And it's also great if you suffer from shoulder or upper back pain, because the armrests on it are fully adjustable. So you can adjust the height (from 6.8" to 10.8" above the seat), slide them forwards and backwards (by 2.5"), and pivot them inwards (by 17.5 degrees) or outwards (by 15 degrees). All of which means you can get your arms into the perfect position to be able to take the stress and strain off your shoulders and upper body. So it's great for back support and relieving pressure as you sit, but how does it do for comfort. The answer is very well! Firstly the curved design encourages you to sit in a healthy posture, relieving strain and pressure and increasing comfort. While the back and seat of the chair are made with a custom designed pelicle mesh that contains 8 different zones of varying tension. This evenly distributes the pressure on your body as you sit, allowing you to relax and sit in comfort rather than pain. Also unlike chairs that use foam or leather, the pelicle mesh allows heat, air and water vapour to pass through it. So not only does the even pressure distribution of the mesh make the chair comfortable, it will also keep you cool and comfortable during the day. And finally the 5 point castor base provides great stability as you sit, keeping you well-balanced. So with so many great features, are there any downsides to the Aeron chair? Well there is one and it can be a deal breaker for lots of people, and that is the hefty price tag. But when you think of it as a long term investment in your health, it's definitely worth the outlay. As not only is it built to the highest quality, it also comes with a 12-year warranty, so this is a chair that will serve you well for years to come. I guess the decision on whether to invest this much in a chair or not depends on how much you are going to be using it. So if you only use an office chair for an hour or two per week then it might not make sense for you, and you'd be just as well served to buy one of the cheaper options here. But if it's something you are going to use every day then the Herman Miller Aeron chair is definitely worth the investment. You can read my full review of the Herman Miller Aeron chair here. High-back design with headrest/neck support. Syncro-tilt mechanism with 3 positions. Breathable mesh on back and seat. Single lever adjusting mechanism for ease of use. Seat can be moved backwards and forwards. Lumbar support can be adjusted, but not separately from the back of the seat. Arms can be adjusted up, down, backwards and forwards. Adjustable seat depth takes pressure off thighs. Can be fine-tuned for comfort and support, but not as precisely as the Aeron. Mesh is breathable keeping you cool and comfortable. However mesh on seat is also a little firm. 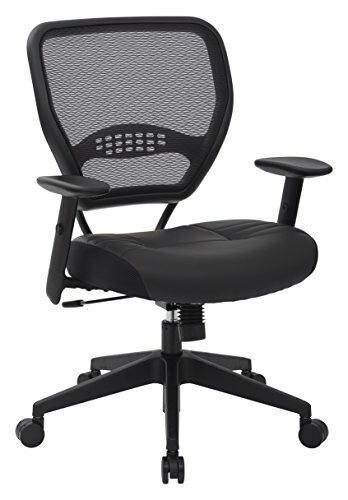 The Ergohuman High-Back Swivel Chair is a really well-made and durable ergonomic chair that is designed to give great lumbar support throughout the day. And it's another highly adjustable chair, although it can't be fine-tuned quite as precisely as the Herman Miller Aeron chair. But it remains a fantastic choice for keeping your back healthy. As there's a built in lumbar support in the back of the chair that can be moved up and down into one of four positions to fit the curve of your spine and help you to maintain a healthy seated posture. And this will be a great help in reducing the strain and pressure on your lower back while sitting. However this lumbar support is attached to the back of the chair and can't be adjusted separately, so you have to move the whole back of the chair up and down when adjusting it. The height of the seat of the chair can be adjusted via the pneumatic lift lever, which allows you to sit at the perfect height to keep both feet on the ground. Taking the pressure and strain off your body, and also increasing blood flow to your muscles. ​You can also adjust the seat backwards and forwards, although it doesn't have the option to be tilted forward. This means you can position your body at the correct distance from the seat back to maintain a good posture and make the most of the chair's lumbar support. The tilt mechanism in this chair is also great way of relieving pressure on your back and keeping your core muscles engaged while you sit. And although it can't be tilted forwards like the Aeron chair, you can still adjust the tension of the backwards tilt, so you decide how much resistance you want the chair to have when you are leaning back. Again this will allow the muscles that support your spine that become weakened in traditional office chairs to remain active and working throughout the day. And if you prefer to sit in a reclined position, there are 3 positions that you can lock into on the tilt that will hold the chair in place. The adjustable armrests can be moved forwards, backwards, up and down, which is great for taking the strain off your shoulders and upper back. And a unique selling point of this chair is that it comes with a high back and an adjustable headrest, giving you neck and shoulder support too. So this chair is great for people who suffer from back, shoulder or neck pain while sitting for long periods. This chair seems to divide opinion slightly when it comes to comfort. As while many people find it to be a very comfortable one, others complain that the hard mesh seat can feel too firm when used for extended periods. So I guess it may be a matter of personal preference here. As what the seat brings in terms of strong support and being breathable over a padded chair, it may lose in terms of general comfort. However this mesh will help to keep you cool and comfortable during the day, unlike leather or foam padded seats. And the tilt mechanism and tension adjustment also allow you to recline easily and with support, relieving pressure and making this chair a comfortable choice. Also the chair is a good one for tall people, coming with a high back that supports them. And finally the 5-point aluminium castor base provides great stability and balance as you sit. So while it may take a little getting used to and be too firm for some, I think this chair is also a really comfortable one for most people. So how does the Ergohuman chair rate overall for keeping your back happy and healthy at the office? For me it's one of the very best. As it has so many adjustable features that all work to relieve pressure and strain while encouraging you to sit with a healthy posture. And by keeping your core muscles active with the tilt mechanism this chair will stop them from weakening and keep your back strongly supported. So all in all it's a great chair for people that want to rid themselves of lower back pain from sitting. And while it's not built primarily for comfort, it's still a really comfortable chair in my opinion. So if you want to take the leap and invest in an ergonomic chair for your home or office, then I'd highly recommend the Ergohuman High Back Swivel chair. You can read my full review of the Ergohuman High Back Swivel chair here. Has a dark airgrid back mesh with built-in lumbar support. Thick padded eco leather seat. Tilt lock in upright position and adjustable tilt tension. GreenGuard certified - low chemical emissions. Height of arm rests can be adjusted. Padded seat is very comfortable. However padded seat isn't breathable like mesh ones, so may make you hot if used for long periods. Tilt tension can be adjusted so you are supported and comfortable as you recline. Mesh on back is breathable, keeping you cool and comfortable. The Space Seating Professional AirGrid Chair is a great value ergonomic chair that comes with built-in lumbar support that is part of it's mesh backing. This support will encourage you to sit with a healthy posture, relieving pressure on your back. However the position of this lumbar support can't be adjusted like it can on more expensive chairs, which may pose a problem if it doesn't hit the right spot for you. But while this chair is made to a simpler design and built more for comfort, there are still a few adjustable features that benefit your back. Firstly there is a pneumatic seat height adjuster, which allows you to get it to the right level to use at your workstation while still keeping both feet firmly placed on the floor. Which helps to ease the pressure and strain on your body as you sit. You can also adjust the tension of the tilt mechanism when you are reclining, which keeps your core muscles active and strong, helping them to support your back. And there is a tilt lock which keeps the chair in an upright position if you don't want it to be able to recline. Finally, the armrests can be adjusted up and down, which helps to take the strain off your shoulders and upper body. However they can't be moved backwards and forwards or pivoted inwards and outwards, which means you may have to position your arms in unnatural positions during the day depending on your body shape. Overall this is a very comfortable chair to sit in. As the curved design makes it easy to sit with a natural and healthy posture, while the tilt tension adjustment will allow you to recline comfortably with support. However unlike more expensive chairs, this chair doesn't have any backward tilt locking positions for when you recline. This means that the chair will push you back into an upright position after you lean back. And while this may not be a huge problem, it does mean you can't stretch back and relax as well as in other chairs. The back of the chair is made with a firm and breathable mesh, which will keep you cool and provide strong support throughout the day. While the seat is made from eco leather and is thick and padded, which makes it extremely comfortable to sit in. Although there is a chance that this padding may make you hot if you sit in the chair for long periods, as it doesn't allow heat and air to pass through like a mesh seat can. And finally there is a 5-point nylon castor base to give you great stability and balance as you sit. As with any value option, the Space Seating AirGrid chair lacks some of the features of it's pricier counterparts. For instance the lumbar support isn't as good and as cannot be adjusted to fit the individual. Also the armrests are not the best as they are made of plastic, which may prove uncomfortable for some people. It's also not as durable as other chairs, especially the padded seat which may show signs of wear and tear if used heavily. So maybe this chair is a better option for a home office rather than something that you'll sit in for 8 hours every day. However, despite these issues the Space Seating Professional AirGrid chair is still fantastic value for the price and a big upgrade over a run of the mill, generic office chair. As it's comfortable to use, encourages you to sit with a healthy posture, and is supportive for your back. I hope you now have a good understanding of the benefits that sitting in an ergonomic office chair will bring you. Because they are a great addition to any home or office. As you can adjust them to fit your body perfectly, relieving pressure and strain, while also staying more comfortable during the working day. So if you struggle with aches and pains in your back, neck, or shoulders from too much sitting, one of these chairs is a sound investment. And the chairs I've featured here are among the best office chairs to go for as they will do a great job of keeping your back healthy and happy. However while these chairs are great for your health and well-being, you also need to make sure you are working smartly to avoid back pain completely. Things like setting up your workstation correctly, taking microbreaks every hour, and stretching yourself out every now and then. I found a great article on Nerd Fitness (which you can find here) that explains how to do all this really well and which I'd highly recommend you check out. So enjoy your new ergonomic chair and I hope that it greatly improves your working experience.